Roaring success: Trix will be unveiled on Thursday. 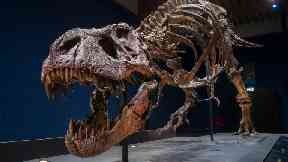 A Tyrannosaurus rex is ready to be unveiled in Scotland as part of its only UK appearance of its European tour. The 66 to 67-million-year-old T-rex, known as Trix, is around 13ft high and weighs five tonnes. The skeleton is on the T-rex in Town tour while her museum in the Netherlands is being redeveloped, and she has been viewed by more than one million people across Europe. Trix's arrival in Glasgow coincides with the final weeks of the visit of Dippy the diplodocus, which is on display at Kelvingrove Art Gallery and Museum, just across the road from Kelvin Hall. Edwin van Huis, director of Trix's home museum the Naturalis Biodiversity Centre in Leiden, said: "We are thrilled that Trix is in Glasgow and we are very excited to show her off to Scottish and UK audiences. "This marks the final stop of Trix on her European tour before she returns to the Netherlands. "Trix is loved by the Dutch people and is an ambassador for us as a museum, which aims to inspire children and adults about the natural world. "It is fantastic the people of Scotland can also admire our queen of dinosaurs and be astonished by nature. "We are sure she will have a hugely powerful impact in Glasgow." The exhibition is organised by The Hunterian at Glasgow University along with Glasgow Life and Naturalis. Timelapse footage has been released to show the complexity of work to piece together the skeleton, which is housed in a bespoke, climate-controlled pavilion within Kelvin Hall. 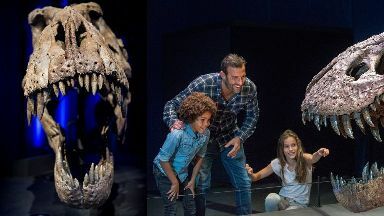 Steph Scholten, director of The Hunterian, said: "T-rex in Town offers a once-in-a-lifetime experience for visitors to come face-to-face with a real T-rex and learn about her life through this superb interactive exhibition.